It was whilst carrying out research for his excellent book detailing the activities and products of the Oliver family that John became interested in tethered cars. Since then he has competed regularly in what are termed 'Old Timer' events, where the cars are either genuine or replica cars from the 40s, 50s, or even later that were used for racing. This is no exercise in nostalgia as the cars are running faster than they ever did and the events are extremely competitive. Indeed, in 2013, John achieved a British ‘landmark’ being the first person from this country to exceed 100mph with a traditional diesel engined car. 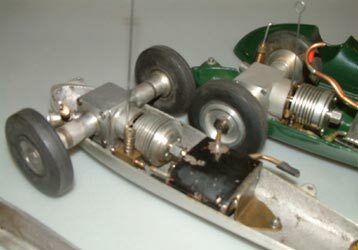 John is particularly taken with the twin-shaft motor and Olivers in particular and for some of the meetings he has been joined by John Oliver who has lost none of his technique despite not having run his cars for fifty plus years. As well as running the cars, John has put his exceptional engineering and restoration talents to a series of new builds and renovations, many of which are illustrated in the following article. 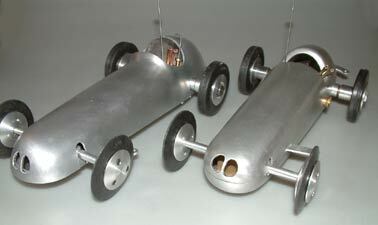 A number of projects he has undertaken have clearly shown a remarkable talent for panel beating in a miniature scale. 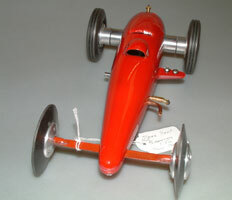 The finest example of this was a run of exact replicas of the ZN 5cc spur-drive car. 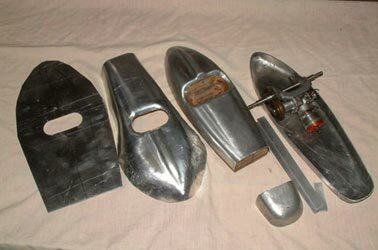 These are very rare in original condition, so John set about forming the pan and body and then planishing the parts before having the distinctive nose-cone welded on. This involved a huge commitment, but such was the quality that the entire run was snapped up almost instantly. One of the first cars to be constructed was this teardrop, which came about after buying a reed valve Carl Zeiss Jena Twin cylinder diesel which was actually made by the works. This was according to Richard Dalby who sold me the engine and who has an amazing knowledge of less well known motors. 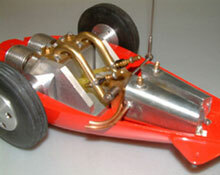 I felt the engine would make a nice twin shaft car unit as it had extended shafts either end. Mike Crisp restored the engine and basically, I did the rest after a lot of chats with my guru John S. Oliver who had built and run a twin cylinder Oliver twin-shaft car engine in the good old days!! 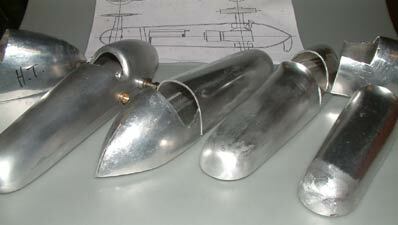 I made up manifolds, with a ganged, twin cut out and twin tanks, to get over the centrifugal fuel flow problems. 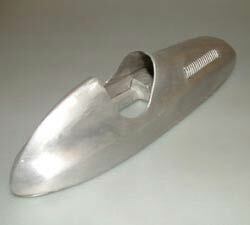 The body had rather poor rear fixing so I Lumi-welded a vertical fin to give sufficient metal depth for a good anchor. I hand beat a cabin like top to cover the manifolds and added an air exit with a push start block at its centre, which would otherwise have been difficult. I was persuaded to part with the car to a good friend from the London area. 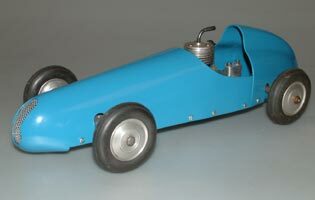 Another early project was this replica of a Dooling F obtained from a member of the Retro Club. 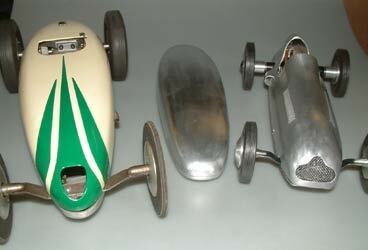 The castings were the Australian 'Meteor' version, which meant the quality was very 'iffy' and smaller that the Dooling originals, leaving little room for the motor. I did some work welding all the fixing and engine mounting holes up and added an alloy strip on the body sides to make up the difference between top and bottom this also welded on. 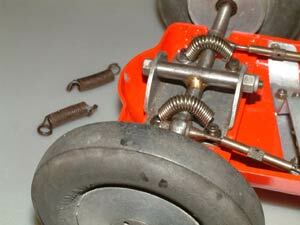 The body securing screws fit from the underside for better appearance, let us hope they do not come loose? 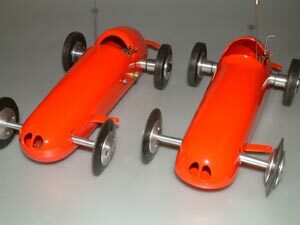 The fuel tank and header tank were made upfrom original drawings and the result is as shown finished in two-pack enamel. 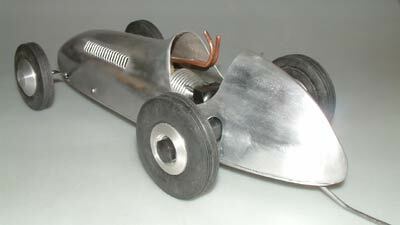 I have braved the rain and done a few more photo's of the Dooling "F" type car, outside in my workshop. One thing I forgot to mention was the fuel cut off which is basically of Swedish design. 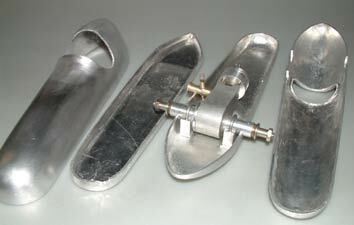 It is a tube nipper type with the piano wire trip held by a clamp and held off the tube by a ramp. 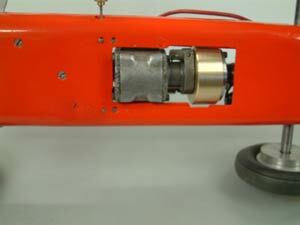 When the arm is caught it flips off and traps the tube and will not reset, which is also important. The dash and steering wheel are home made and the seat cushion is cut from a car floor mat. The next series of photos show very nice original ZN alloy louvered body and cast pan, which I have done some work on since I got it. Basically the body now fits the pan and is straight. I am planning to put one of Ian Russell's Jaguar twin shafts in it, but wish to avoid loss of too much originality! In order that it could be run, the cast in chassis cut-outs I intend covering with an alloy plate so fuel drop is minimised, this will be screwed on with 6BA screws and sealed with silicone. Alongside this is the last of my replica hand beaten ZN bodies of which I made six and I intend to put a Dooling 29 gear driven unit into this body. 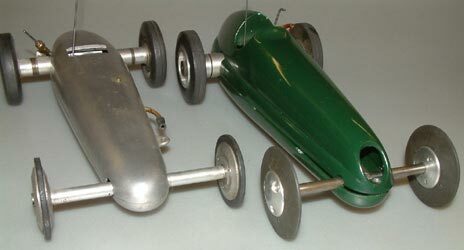 I obtained the original bodies for the two ZN cars off Gordon Yates in Barton under Needwood who went to school with my son Paul. The original larger car was sold to Ron Reiter in USA. Another project that involved serious panel beating, and in almost miniature proportions was this lovely replica of a Wreford ‘Half Pint’. 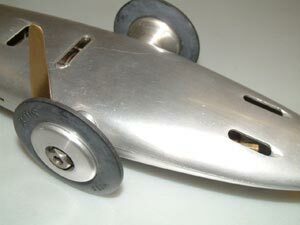 The 'Half Pint' with the wooden bucks made for bending up the chassis, which is very easy to do. The body, nose and tail were more difficult and I had to cut and shut, using Lumiweld to rejoin. This material works OK, but discolours after a few days/weeks so I usually paint over the top to hide this. Two 'Oliver' powered cars, the first a Tiger 2.5 with one of John S. Oliver’s last engines from a batch of ten made in 1997. The body is an Ivan Prior casting off JSO original patterns. 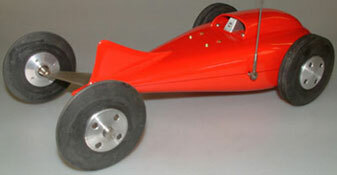 The car was built by Gordon Yates. The next car, a ‘Bottoms Up’, is Gerry Buck’s car, which I traded with Miguel de Rancoune for some rare French engines he wanted from me. I did not realise the significance of the engine until showing it to John Oliver some time later. He confirmed it was one of a batch of about seven made with disc valve induction. It achieved about 68 mph from memory, still using the original Raylite tyres. 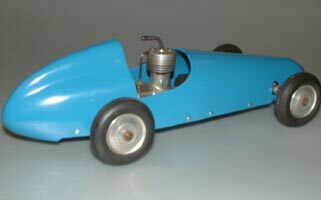 I lost the top of the body and it flipped on another occasion when being run at Orebro in Sweden as a consequence of the hard tyres. All my running has been done at Orebro where I feel almost one of the locals, they make you that welcome!! The Slabang is my take on this superb car, because I decided rather than make a dedicated engine fixed with clamps and with narrow track for drag reduction, I would use a basically standard Twin-Shaft Oliver Tiger. 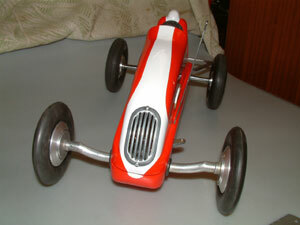 The castings and front suspension were obtained through Ulf Ek, as were the Zetis Mite tyres. By milling the engine mounting pad at an angle I got the engine almost horizontal within the body, and it uses standard fixing. The engine was one John S. Oliver restored mechanically for me in the days we both started visiting Orebro. The engine casing had been roughly filed when obtained from one R.T.Pole, so I set to and cleaned it up to make it presentable, to my eyes anyway! 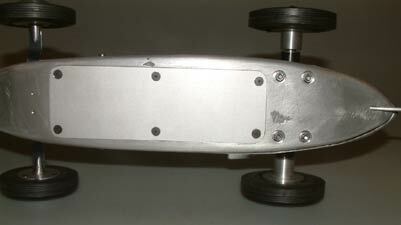 The top half over the crankcase is extremely thin being just 1/32 inch in places, but just adequate. 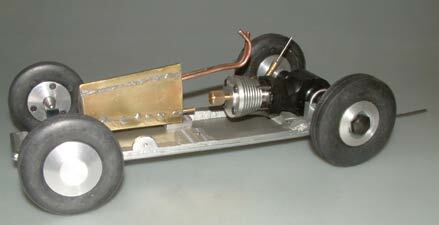 I had discussed engine cooling of the original Slabang with JSO and I decided to try and improve this on my car. 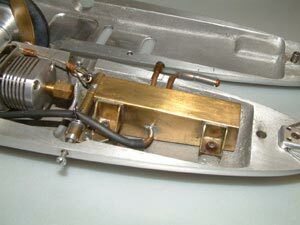 I therefore did not use the tiny frontal slot and single exhaust outlet, going for an NACA duct and twin extractor slots in the low-pressure area at the rear end. I also made an exhaust manifold to closely fit to the body top to keep all exhaust and especially exhaust heat out of the body. 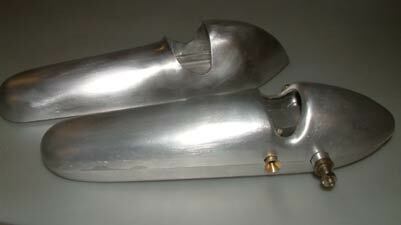 The NACA duct was positioned so that compression can be adjusted with the body top on, likewise the needle valve was extended to align with one of the exhaust ducts at the rear end to facilitate external adjustment. 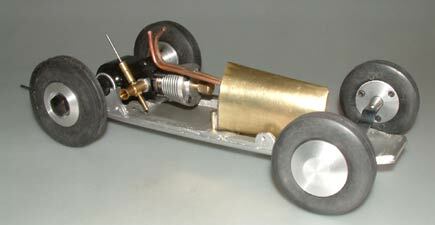 On the original Slabang all engine adjustment has to be made with the body top off, which I think is inconvenient, to a novice anyway? The aim of these changes was to reduce cooling drag and allow the engine to rev more freely through better cooling, with easier engine handling. With the travel problems in taking cars on aeroplanes in a suitcase, I needed to use a cut-out system that could either detach, or fold down and I decided to use the latter. 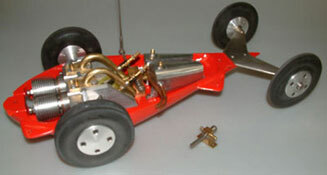 A brass lever pivots in a hole machined into the body side and connects via a cable with a Stuart Robinson (he of Team Race fame) TR spring "Nip Off". 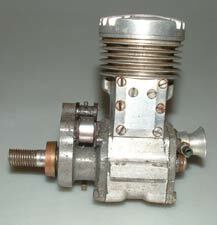 One modification for 2013 that certainly seemed to help performance was fitting a peripheral jet carburetter. The proof of the pudding is that in 2013, in spite of the higher drag from using a standard wider track engine, the car achieved 160.40kph, which is just over 100 MPH. As the car had been slightly over compressed and started to slow after about six laps, I think set correctly there is more to come? The Swedes aim for 180 KPH with their dedicated and tuned units. Lack of practice is the greatest single problem with no suitable tracks in the UK and the other is getting used to borrowed fuel. Thanks to Ulf Ek for helping me with that and running advice. I must also thank Lars Olaf Johansson and Kjell Erik Odelius who have helped me such a lot. In fact all the Swedes without exception, from World Champions down are helpful, friendly and welcoming, why not get over there, it's cheap with Ryanair. More twin-shafts. 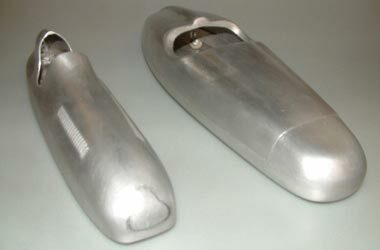 This car is made up from an unknown chassis, which came with two bottoms and one top half. Maybe you can identify it? An Oliver Twin shaft will just fit in. 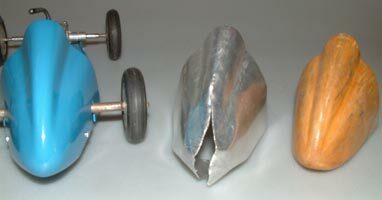 I made a pattern and hand beat up a new top in 1/8 inch alloy to make two complete sets. I fitted a Bill Bannister twin shaft of 1.5cc on which I reduced the axle size a little as well as make new wheels, as I felt the originals looked a bit heavy? I fitted a small air scoop on top for a reason I cannot now remember, possibly styling? 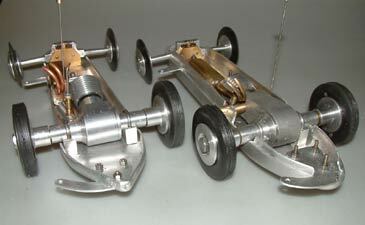 The front axle is spring steel with riveted on stub axles to give a rudimentary spring action. I no longer have this one and it may have gone to Steve Betney? One thing visiting Sweden has taught me, is that springing is necessary once higher speeds are realised even on a track as good as Orebro. Orebro is within 1mm all round and yet my Ex Gerry Buck 'Bottoms Up' had problems keeping track contact? This is so true. 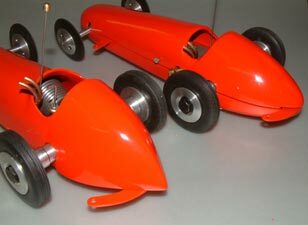 The twinshaft car run on the FEMA track at Kapfenhardt was very unstable, leaping around constantly. 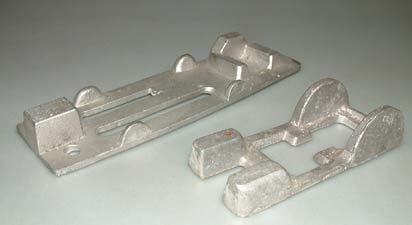 Damped suspension is now an absolute requirement, especially on the smaller and lighter cars. 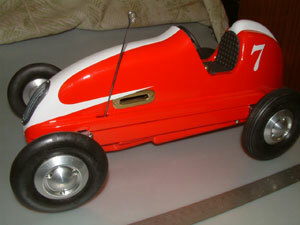 My latest restoration (below), is an Orebro BRM made very near to the track I run at in Sweden. 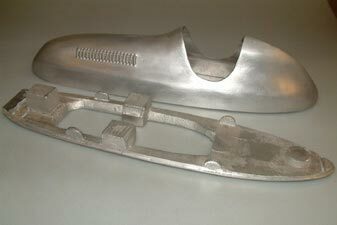 It was a much maligned and used pair of castings when I bought it off Rickard Helander two years back. I had to weld up eleven holes in the bottom and seven in the top. 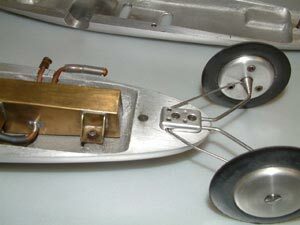 Even then a lot of work was required to finish off previously rough areas in the intake and to cut through the intake in front of the cockpit and body matching. 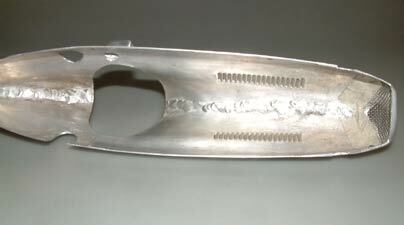 I also added a better front body fixing as the metal was too thin originally and had pulled through, as had the rear fixing. I added a spring steel front axle with riveted stub axles to give some rudimentary suspension and the twin shaft is a CS replica (unfortunately). Has any one got an Oliver Twin Shaft? 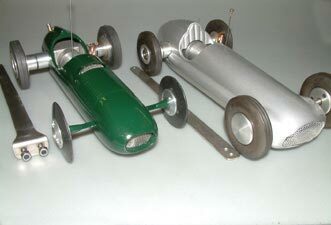 The Mercedes for comparison (lower right) is a replica made from Angeloni castings with a Castanetti replica ETI engine. Possibly the rarest of British cars are the two ZN scale bodies that were planned but like their engines, never made it into production. Amongst the items sold by Alan Whitehead several years ago was one of the smaller of the two, illustrated above. John has now completed building this unique? example. 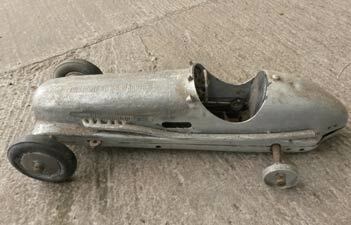 My current rebuild project, a ZN 2.5cc car body and chassis which I purchased off Gordon Yates. 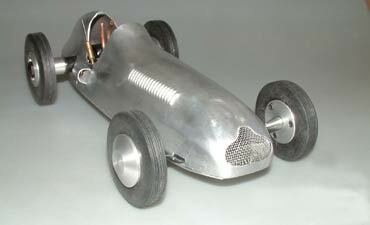 Gordon had made the tank for another car and had also added a filler front and rear of the chassis to give more support to the body shell. This was pressed in two pieces and then welded to join. 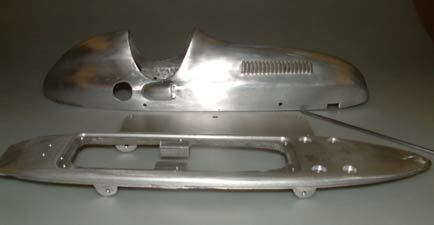 The chassis was probably adapted to supply with the body from another car altogether, but is ZN. I say this because the engine mount blocks which I have machined off place the engine under the bonnet front and would spoil the shell. I made up a filler plate set into a milled recess on the underside of the chassis to stiffen and add a site for the pan handle yet to be added as is the fuel cut off. I decided to utilize the Twin Shaft Jaguar replica by Rustler making up new wheel hubs and fixing nuts as Oliver usual practice. I also removed the front axle mounting block to allow fitting a spring steel mount for stub axles and placed the bearing outboard as space was limited to get the track correct. I have fitted anti lift device into a hole drilled at twenty degrees through a cast in pad at the chassis rear as in the Slabang. The grill will be fixed along with the nose badge using silicon after painting. The last photo shows an SMRU Swedish chassis I think(?) along with an unknown British casting. Does anyone recognise this? 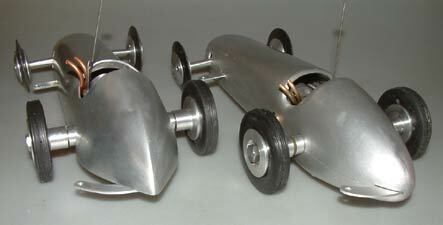 Update on my latest project making replica bodies for the ZN 2.5cc gear driven Race Car. 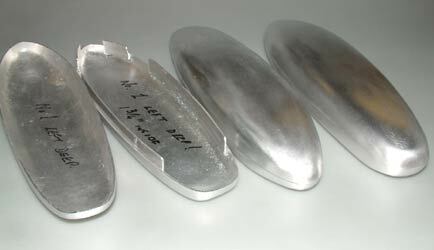 I have used 16g aluminium top and bottom and have made four sets so far. I have enough material to make three more bodies and that may then be the end of me making hand beaten bodies. 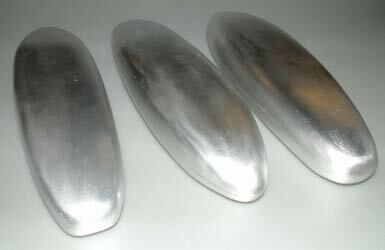 The work is quite demanding in time and there is almost as much work in cleaning up and polishing my amateurish beating as there is in forming the bodies. The alignment and jointing to get a good fit also takes a lot of time. I suppose this is all very difficult to understand if you have not had a go at it? 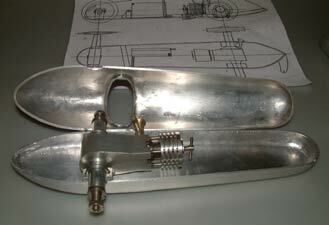 I have made the internal height about 1 11/16 inches to just clear the Oliver aero engine lugs. 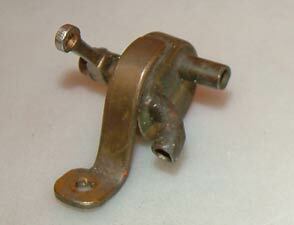 Cutting the lugs off for car use is abhorrent to me! 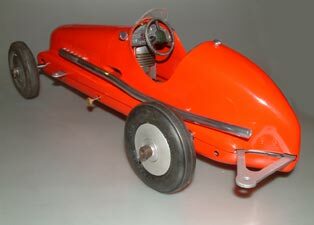 I have already described my original Swedish Slabang car earlier on this page, following the auction it can be compared with John Oliver’s version. John built his car after obtaining the chassis and front suspension off Ulf Ek in Sweden the second time he went with me to Orebro. Ulf Ek was co-driver to Stig Blomqvist in the Audi Quattro when they won a number of World Rally Championships. Ulf took me back to the airport on one occasion and he does not hang about, in spite of the draconian police measures if they catch you?? The two cars side by side show the differences in approach. 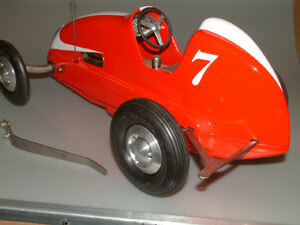 I used a badly filed up engine that came from Peter Hill in poor condition. JSO overhauled it for me and I refinish the cases by hand as shown. It has run several times since, getting faster each time culminating in its last three timed runs at 100mph plus. 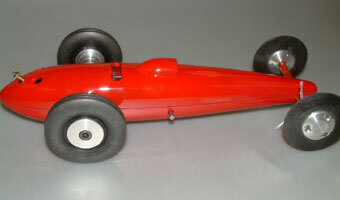 The track is standard Oliver Tiger twinshaft, which puts it at a disadvantage to the Swedish and JSO car engines, which have a much narrower track of 87mm. The standard track with more frontal area of course is 102mm. 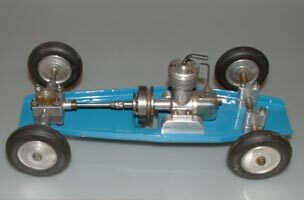 John built this engine especially for the car and it utilises standard screw fixing at the front with a clamp at the rear, so it is unlike any other Oliver Twin Shaft engine with its mounting system and shorter drive shafts. 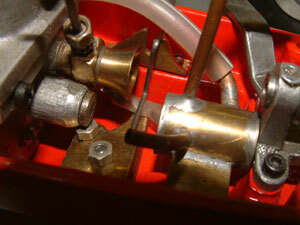 The Swedes use three clamps on their engines with one at the rear and one each side. So both John's car and engine are unique and dedicated to each other. It was also the last car John ever ran on his last visit with me to Orebro. So it is very special to me. The engines I think need little explanation except one of the twins was built by Ray Ivey a good friend of John who worked for RCV when they helped sort some of the problems with prototype engines. 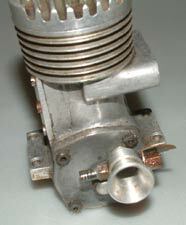 John assisted Ray in the design and supply of parts for this engine, which has the fluted crankcase. The two MK4 Tiger based engines were two of the three prototypes for the MK5, schneurle ported engine one has a side exhaust and the other rear exhaust. 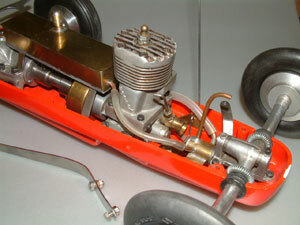 The engine with standard Oliver cooling fins is 5cc total and the second is about 6.5cc and schneurle ported. John only made one of each. The ex Ray Ivey engine was given to me by John in dismantled and damaged condition when he last came here to stay with us. 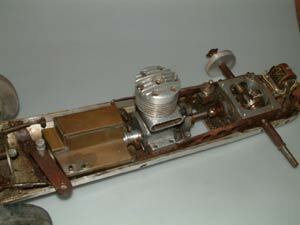 He had supplied advice and some of the parts including the cylinder assemblies to Ray. It had a broken crank and is now in running condition again. John is a great enthusiast for anything relating to the Oliver family and what they have produced over the years. Unfortunately none of their early cars are known to exist, although there are numerous examples of their production versions. One of the most intriguing was 'Busy', which used the prototype of what was to become the world famous 'Tiger' twinshaft to such good effect. 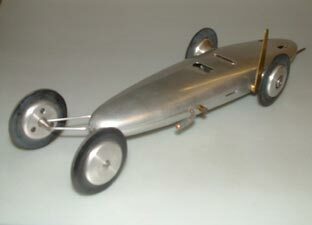 This car was sold to Harry Howlett and became the basis of the first cast 'Oliver' car. John made the decision to recreate this iconic car, but faced a dilemma. Only photos of the original car existed, yet the published plan showed an entirely different layout, so what to do. Well, John being such an enthusiast, why not make both. 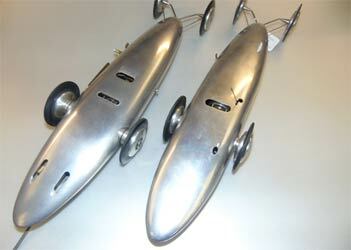 Not only was this quite an undertaking as each had to be formed, by hand, from sheet aluminium, but John very kindly offered to make a few 'extras' for select 'friends'. 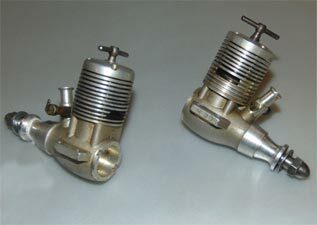 The OTW version has already been described, but here are John's pair of Busy replicas. 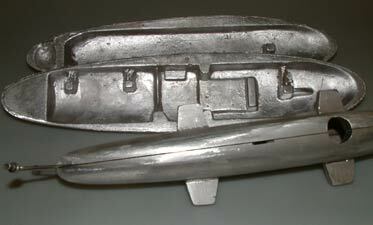 On the original car the top half of the body overlapped the pan completely with a joint at the front of the cockpit cut out. The plans show the top half of the body flush with the bottom half and the joint about 3/8th of an inch up from the bottom of the pan. 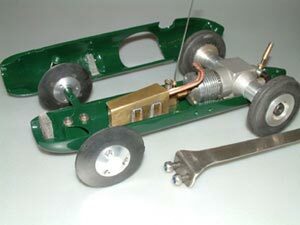 Being and ex design engineer, John decided to go one stage further as it was not a true replica and make the joint line through the centres of the axles, avoiding long slots in the upper body that are evident in the prototype. 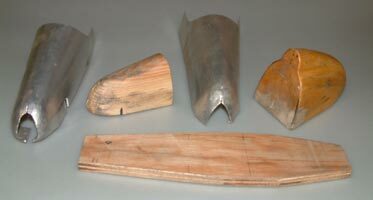 Above can be seen both styles with the further addition of the cockpit surround on the MkII being turned in to make a nicer shape and provide more strength. Engine choice provides a series of interesting options, but comes down in the end to what is available. 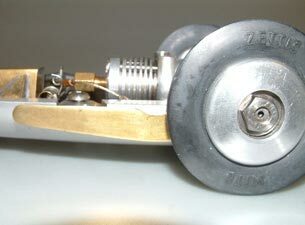 Busy was originally fitted with a Jaguar twinshaft and then with the prototype Tiger, which still used U bolts to hold the motor down. The only RV or RVB motors known to exist are in cars and, as we know, trying to find Oliver or Olive style twinshaft motors is nigh on impossible. John was in exactly the right place when the original Oliver 'Nine Port', seen on the left became available. 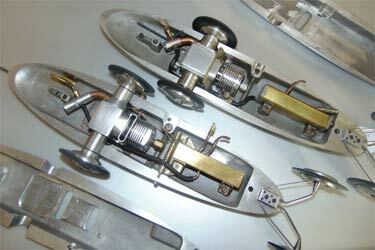 The motor on the right is a 'Rustler' reproduction Jaguar with a second crankshaft added by John. 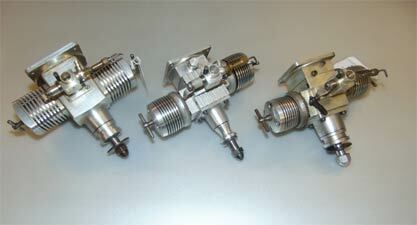 Above on the left is the closer replica with the Jaguar motor and the rear tether bracket coming through the pan flange. The independent front suspension is an engineering tour-de-force and a matter for speculation as the plan shows a pivoted beam axle, but with no idea if there was springing of any sort. In 2016, OTW was contacted by the then owner of the car asking if we knew anything about it and possible routes for selling it. What was immediately obvious was that the body and pan were either a commercial product that we had no knowledge of or that it had been built by a very competent engineer. 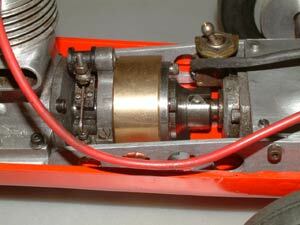 There was a further clue in that the motor was homebuilt with a McCoy type monobloc crankcase casting. 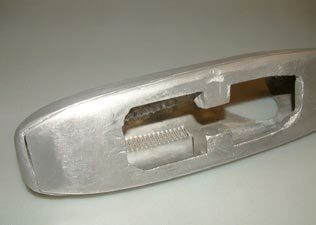 As was often the case, there is a cover over the transfer port indicating that this had been machined from the outside, rather than cast in. The timer may well have been a commercial unit. 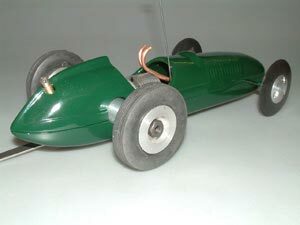 ZN wheels and tyres at the front, and we suspect wire wheels at the rear, all with faux brake drums finished off what was very close to being a scale car. The rear wheels had gone missing, just the hubs remaining. The flywheel unit was also missing, but importantly, the magneto that runs from a separate bevel gear on the back axle was still in place. A fascinating car. A short while later, John Goodall sent us further photos of the car cleaned up somewhat, but otherwise untouched, which is how it remained until well into 2018 when we were delighted to see it in the flesh for the first time at a Retro Club meeting. Over the winter John undertook the renovation/restoration of the car and continues the story below. Motor mount and radius arms to gearbox Fine, home built, RRV motor. This is my latest rendition of a car I bought about two years back. 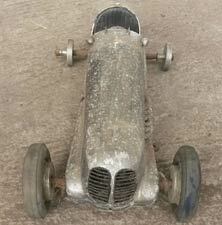 When sold to me the vendor thought it was an Arthur Weaver car and although engine mount and some other details are similar and representative of his work other items are less obvious, unless it is one of his early efforts? 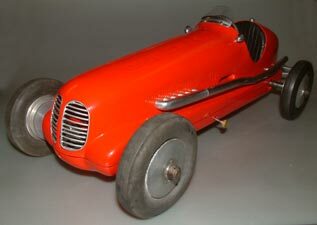 The bodywork is very nice and there is a lot of detail. I have had some instrument decals printed as none seemed available on the internet. 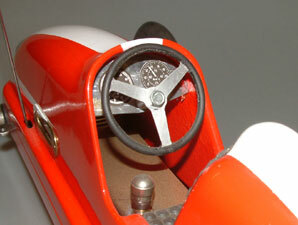 I also added a cut out as none had been fitted and mounted it in the low tension side of the magneto ignition. 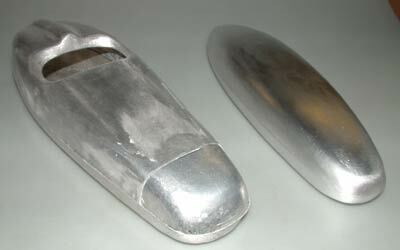 I also replaced the missing rear wheels and made the wind screen and exhaust pipe due to corrosion in the original. 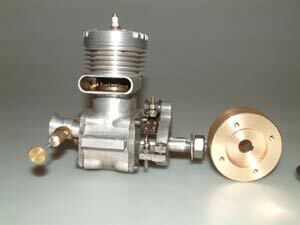 I include above a few pictures of the engine which is very interesting in having magnesium front and rear housings also the timer frame in this material. This suggests someone built the engine with access to fairly scarce materials at this point in time, maybe someone in the aircraft industry? 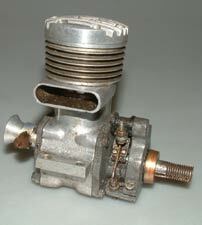 The engine is very well made with excellent compression on the ringed piston and fits are superb too. Interestingly the backplate is stamped 2, which could suggest another is in existence, or might have been? The original flywheel was missing so I made a new one, doing all the turning and cutting the keyway using the lathe top slide. 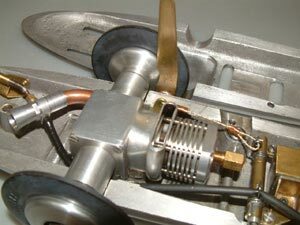 The direct drive flywheel and original coupling is shown above right. The front springs I have now made in stainless steel, shown with old for comparison. 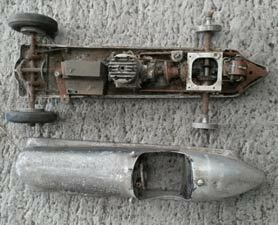 The engine and gearbox are mounted as one unit with radius arms and was angled down, I suggest to clear the body work and so a cut out in the chassis was needed. 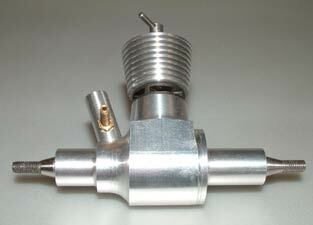 I believe this fuel cut off valve was made for the car and mounted just in front of the engine on the off side. 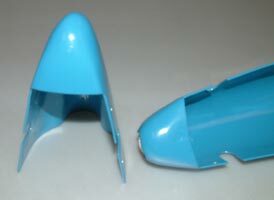 It allows air through it now in the off position, so was not re-used. 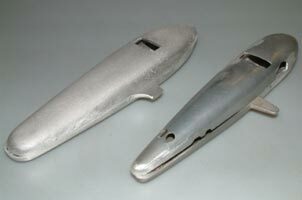 Cork was often used as the sealing element and from my vintage motorcycle experience, petrol taps with cork seals dry out with little use and become unusable. Boiling in wax sometimes helps to revive them, but this unit cannot be dismantled. 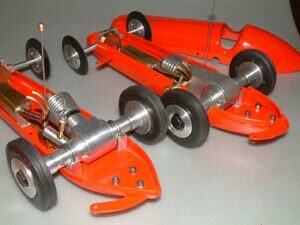 Thanks to John for sharing all these projects and congratulations on his achievements in running classic tethered cars.